Of course, after two hours staring at 300 practically identical photos I decided I didn’t like ANY of them and we’ll have to take a new one. I just can’t bring myself to put a photo of myself in a tank top on a Christmas card. OK FINE, so the real reason is I’ve lost 10 pounds since that trip and who wants to send every single person you know a picture where you’re fatter than you actually are? So “take a really awesome family photo” is on our list of things to do this week, right along with “clean entire house” and “knit a couple of sweaters”. 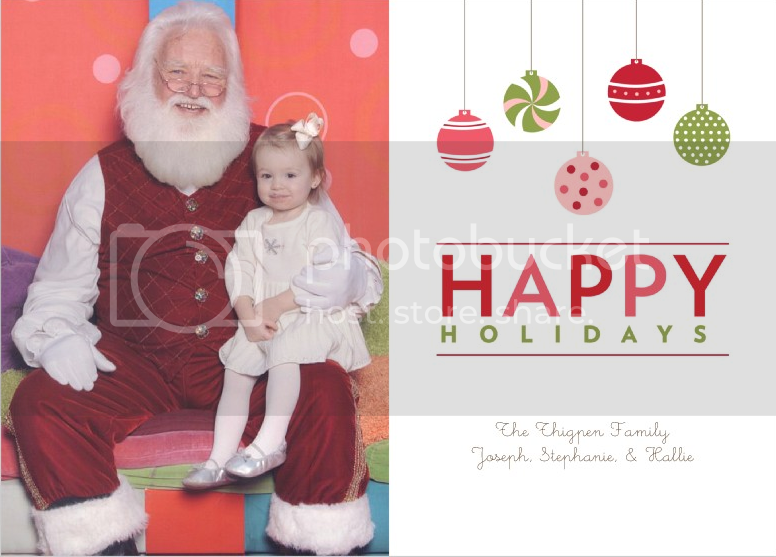 FORTUNATELY, Shutterfly makes the rest of the card super easy. Even more fortunately, they offered me free Christmas photo cards this year (although my beach photos were already all uploaded to their site, since I ordered an adorable photo book for Sara, the friend whose birthday we were celebrating) in exchange for telling you all which one I like best. How could I say no? Pros: I don’t have to write a separate Christmas letter! Cons: I don’t think we did enough interesting stuff this year. Cons: I CAN’T MAKE UP MY MIND! Now here’s the best news of all: Shutterfly has given me three codes, each good for 25 free cards, to share with you. Leave a comment below telling me about your holiday card tradition – do you skip them? do you write the BEST family newsletters? do you make your family wear matching pajamas and pose in front of the tree? – and I’ll use Random.org to pick a winner next week. You don’t have to be a blogger to win, just make sure you use an active email address when you leave your comment so I can contact you if you win. Good luck! Are you totally freaked out now, thinking about how Christmas is only 9 weeks away? Last year was our first Christmas with a baby, so we sent a shutterfly photo card. It was really well received and now this year we have ANOTHER baby so I can’t wait to get a picture of my two boys for a card. I don’t really have an actual tradition. More then one year it has happened that I start all organized with my list of who is getting a card and I get addresses and even fill out and address all the cards. Let’s face it..my oldest two boys are 13 and almost 15 and every once in a while I find a stack of cards with pictures in them of the boys when they were tiny. Heh, so far my holiday card tradition has been skipping them because we never have the money amid all the gifts and so on! But if I won, I’d start a new tradition. We sent out Shutterfly cards last year, since it was our first year with a baby. My husband and I are trying to decide on what traditions we want to have as a family. We got married one year, had a baby the next… we really didn’t give ourselves a lot of time to figure all this stuff out. I think you are totally entitled to decide you want to take a new picture. I’d probably do the same if I lost weight between our six-month photo shoot and Thanksgiving-ish time. We are actually planning to send Christmas cards for the first time this year since Noah was added to our family earlier this year. I know we have a lot of family members who would love to see him and how he’s grown. I think it’ll probably be an annual tradition from this point. I like the first design. And I can vouch that my picture book is AWESOME. And finally, I’m a lazy shmuck who doesn’t send Christmas cards, although many of my single friends do. Although if I did mine would be super depressing this year. Happy holidays from the unemployment line! I try to be creative each year and think of something different. Last year we did a frame picture. This year we are going to hold the letters to spell JOY! We usually take a family picture in front of the Christmas tree and put that pic on our Christmas card. Last year was our first Christmas as a family of 3. We took a really cute family photo at the Christmas tree farm and I think we’ll do the same this year. The great thing about Shutterfly and similar sites is that you can be a total slacker and wait til the last minute but they’ll still get the cards out in time. We didn’t send any cards out last year because of a new baby in November. But, we need to get back on the wagon because people want to see Knox and know that we haven’t fallen off the face of the earth – since we live 2500 miles away from ALL our family. Eek, can’t believe its only 9 weeks – that means only FOUR more paychecks till then!!!!! Hoping to do better this year. Ooh, pick me, mr random number generator! My tradition is to totally ignore sending out Christmas cards, but now we have the baby and all, and I would totally send them out if I won this gift certificate. Totally! We don’t have a “tradition”. Last year was the first year we did photo cards bc we had Carson (sorry, don’t think you should be sending photo cards got Xmas if you don’t have kids!). This year, I am stressed over getting a picture of the kids together that is usable! We totally sent photo cards the second year we were married. It was a photo of us standing in front of some cows. We’ve been doing photo cards since we were married; short & sweet greeting (no newsletters because that’s what the ole blog is for) :) Last year I had a fantastic idea for a photo of the boys, but my (at the time) six-week-old was having no part in it. Hopefully this year will better! Every year I swear is the year I’ll send out xmas cards–especially since having the girls. I’ve even gone as far as designing the card and picking the pictures. Why the heck I didn’t get them made and sent out? Who knows. Maybe this year will be THE year. ^why shouldnt you send them out if you dont have kids? Thats crazy, childless people cant send out picture greetings too? We even sent one years as a “save the date” for our wedding. Shut up it’s NOT 9 weeks away. DENIAL DENIAL DENIAL. My whole family is coming to spend it with us and I’m panicking now about rooms and decor and making sure my house looks like a freaking Martha Stewart photo spread. Yeah… right. We have never done a Christmas card before. However now having our 5 month old baby boy we are so excited to send them out to family and friends for the first time to parade our handsome little one!! well, we ususally do a family picture. but last year we just used the picture from hallie’s pictures with santa. little did i know, santa had some MAJORLY huge balls. i didn’t even notice it in the picture that i sent out on over 120 cards, but everyone else did. you wouldn’t believe that amount of e-mails asking if santa was just a pervy old man or hung like a rhino. so, yeah… making up for it this year with some cute cards that don’t have santa’s balls all over them would be nice. As a child we always sent out picture cards of us all with our pet bunny…. Since I’ve been on my own I’ve made my own cards to send out with the exception of two years…. Both of which I was too busy making Christmas cards for other people who had ordered them from me! I am a little freaked out that Christmas is only 9 weeks away, BUT I am totally excited because it is my most favorite time of year!!! I usually do photo cards with a personal message written on the back. I have this issue where I can’t send a card unless it has a message. And last year, I think I addressed mine in October because of that whole Christmas baby thing. I win. OMG I love the highlights pic. I got one like that last year & was already spending too much time trying to figure out how to design it. And you did TONS of interesting stuff this year- we read it every day! Each and every year I hand write out my cards in which I have chosen individually for each and every person. I include a funny Christmas quote, something along the lines of “your trying to tell me he travels the world only at night, comes in thru your chimney and carries a big bag of wrapped gifts…. And your sure he isn’t doing anything illegal?”. Once I have competed about 5 I’m in fake years about how much my hand hurts and my husband gives in and writes the rest. TeeHee and thanks to a horrible memory I do this each and every year! I think he would be the happiest if I won! I think I may start a holiday photo card tradition this year – we just had a maternity photo shoot done this weekend, so it’ll depend on how those come out. And yeah, totally freaked that Christmas is in 9 weeks, cuz that means my Bebeh Girl is due in 9 weeks!!! How did this go by so fast??? Ack. I never enter these things but that highlight card looks awesome. We have highlights! new baby! new house! less sleep and sanity! As far as card traditions go we dont have one. Unless you count the cards I had made last year and forgot to mail. With baby I want to make a picture card a tradition. Preferably one that actually gets mailed. love me some shutterfly!! oh how i would love to win some freebies!! I like my cousins’ tradition. Three kids somewhere in the yard or on a beach or posing during a family trip and one of them is giving the camera the bird (aka the middle finger). Of course these pictures don’t get sent to EVERYone (just family I believe) but they crack me up every year! I start every year with Grand expectations of getting my Handmade Christmas cards completed in time to mail out. So I spend lots of time designing the perfect Christmas card, here is last years cards ( http://stampinstampede.blogspot.com/2010/10/card-class-at-warren-township-community.html ), of course my plans often get waylaid by the kids activities (I only have 4 very active teens) and I usually end up on Christmas still having material cut and ready to assemble but only a few Christmas cards made. By the time I am ready to start the next years cards I have either used up all my pre-cut material or have decided I really didn’t like last years card anyhow and start the process all over again. We have skipped cards the last two years because we’re lazy. But Aaron built a new stone wall in our backyard that has built in seats for all three kids, so we’re going to try to get a good picture on that and actually send cards this year. Free would make it even more likely to happen! I used to make all of my own adorable little Christmas cards. Then I had a kid and sent out store-bought cards. Then that kid got cancer and I didn’t even send out cards this year. But I HAVE to do cards this year to let everyone see how he’s doing and shutterfly cards would be perfect. Cassie, so great to hear from you! I heard Sam you had a great scan & Sam is doing well. You DEFINITELY need to send out cards this year to celebrate! Our tradition is as follows: Husband: I want to make the cards this year. (It is summer) Me: Excellent! Me: Hey, you might want to start thinking about the cards. (It is September) Husband: Oh yeah, I forgot about that. Me: Have you started thinking about the cards yet, we should really get moving on it. (It is the end of October) Husband: Oh, whoops! I’ve been kinda busy. But I still want to do it. Me: I have an idea of the cards (It is mid November) Husband: Aw. I still want to do it. Me: *eyeroll* Husband: What is with the cut tubers and food dye? (It is December) Me: I’m making out cards. Husband: Oh. I always send holiday cards to family & friend (some near, most far). I grew up in a home where my Mom always sent cards and taught me the importance of never losing that “personal touch” with people God has brought into your life. I love holiday cards…especially Shutterfly’s! We usually just do regular hallmark cards without photos or anything. This year it would be neat to do something different! Last year was the first year I tried using a customized Christmas Card, which I loved and plan on doing this year as well. It is so cool to be able to recap your year in pictures on a card a send to all those who don’t live nearby.